S ome of the quarter's best performers were growth funds, considered the most vulnerable in a recession, but the ones most likely to soar when the economy picks up again. "Appetite for risk is rising," said Tom Roseen, an analyst with fund tracker Lipper Inc. "People are betting on the economy to grow a little bit." Some of the strongest stocks during the quarter were materials and energy producers and companies like retailers that depend on consumers' discretionary spending. These types of businesses often do well as the economy picks up. 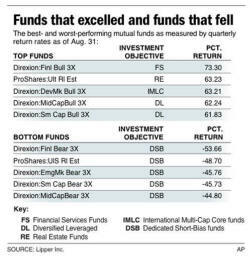 The gains helped lift a range of mutual funds. Diversified U.S. stock funds posted an average return of 14.9 percent. For the first nine months of the year, the return is 22.7 percent. These funds in general have varied holdings instead of focusing on a particular industry. The latest figures reflect trading through Thursday, and so don't include the final four trading days of the third quarter. The average return at large-capitalization value funds was 15.5 percent, according to Lipper. For large-cap growth funds it was 13.4 percent. Value funds hold stocks that are believed to be undervalued and that are expected to pay dividends. Growth funds, meanwhile, hold stocks that are expected to show strong price appreciation and that are not likely to pay dividends; these stocks tend to include many smaller companies without long track records. It is the second straight quarter of strong returns after major stock indicators bounced off 12-year-lows on March 9. In the July-September period, a steady diet of improving economic news has given investors hope that the economy has emerged from the longest recession since World War II. The S&P 500 index is up 13.6 percent for the quarter and an enormous 54.4 percent since hitting a 12-year low of 676.53 on March 9. The index, which serves as the basis for many mutual funds, is still down 33.3 percent from its peak of 1,565.15 in October 2007. Analysts warn that the stock market's rally can't continue at such a pace. "My caution in seeing these great numbers is that people are going to start jumping back in when, in fact, maybe we're due for a little breather," Roseen said. "We've got to take a break." Since March, funds that focus on financial services stocks, among the most badly beaten by the recession, have an average return of 114 percent. For real estate funds, which also took a huge hit, it's 93.3 percent. For the market to hold its advance, investors will need to see more signals that the economy is rebounding. Samuel Dedio, portfolio manager of the Artio U.S. Smallcap Fund, said investors should watch the earnings results that companies will soon report for the third quarter. "The earnings power of the companies will really dictate how far this rally can go," he said. Some of what has driven the climb in recent months has been a fear among money managers of missing out on the recovery. In the past 60 years, the S&P 500 index has reached bottom an average of four months before a recession ended and about nine months before unemployment hit its peak. That means some of the quarter's huge returns aren't surprising if the economy is indeed mending its wounds. Small-cap value funds have a return of 20.4 percent and small-cap growth funds are showing a return of 15.2 percent. Small-cap stocks often lead the stock market out of slumps as investors look to capitalize on companies that could see quick strengthening of their business. Sector equity funds, which focus on areas like real estate or biotechnology, had an overall return of 17.5 percent. Global real estate funds turned in a return of 23.7 percent, while basic materials funds posted a return of 21.7 percent. For natural resources funds, the return is 16.7 percent. Gold funds posted similar returns. World equity funds posted a return of 17.8 percent for the period. Funds that try to outpace the moves in the market by using leverage achieved some of the biggest returns. Analysts caution the performance of the funds can be volatile so investors need to know what they're doing before stuffing their money in these types of vehicles. 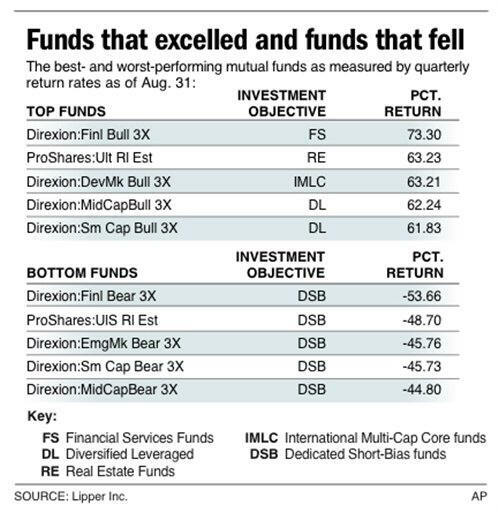 One fund category did get killed during the quarter: dedicated short-bias funds. These funds make bets that stocks will fall. 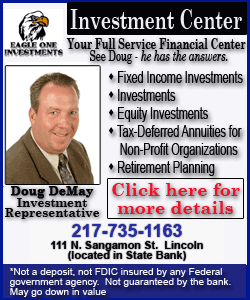 The rally in stocks left those funds with a negative return of 21.7 percent.